The first Faction Titan has been killed today by Project Mayhem. This Vanquisher Titan, the Serpentis variant to the Erebus, was killed in the low-sec system of Maila, a few AU off the Ghost Legion Keepstar in the system. The pilot, Lx33, just left Northern Coalition. along with his corporation a few days ago. The exact circumstances of this kill will be updated soon™ when more info is available to us. It also appears the pilot himself was sold recently. According to Snuffed Out’s pilot hy_wanto comment on Reddit, the op took several hours before the pilot finally got baited on a free carrier, and was dropped on by over 100 pilots, including a good number of dreadnoughts. Other sources tell us that the pilot was told not to warp from the Keepstar, but thought he could get away with it. 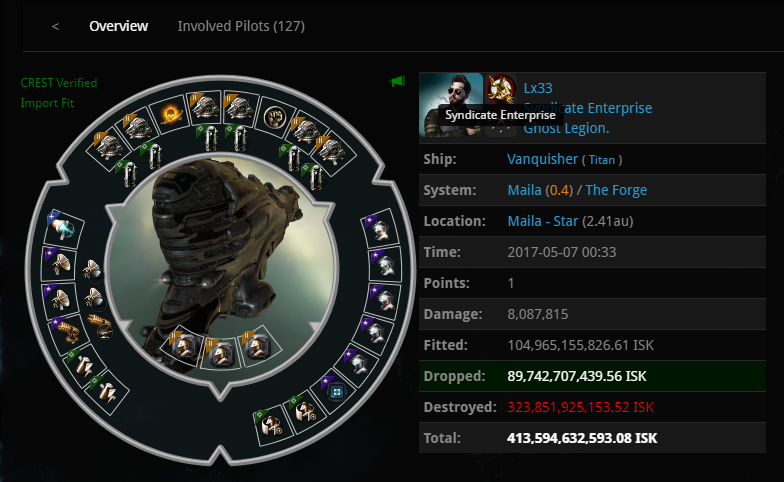 Ghost Legion tried to respond to the drop but could only gather a few kills, and lost several FAX while failing to save their over 400 Billion isk toy. UPDATE: Imperium News got an interview with the owner of the Vanquisher: Lx33. he contacted us in order to explain his view of the events. Lx33: Hey Bro. What’s up? Do you want to know what happened from my point of view? I am quite happy with what happened, to be honest. Kinda thrilled. INN: Yes, as said in the article: we will update when info is available. INN: So what’s your version? Why did you warp in? ’cause you warped in, right? Lx33: Yeah, I warped it. Basically, one of my guys came on TS yelling about a cap fight going down on a WH, so I formed a fleet to kill them—They were in Bhaals and FAXes. We warped in and they dropped a few more dreads and killed the FAX, we then reformed into Prots and Gauds. Eventually, Fafer and I decided to use supers since we could not break them. 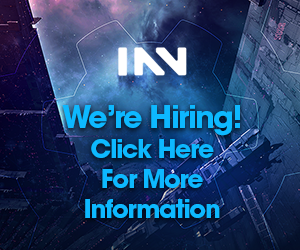 INN: Fafer being the Nyx pilot, right? INN: Yeah we saw that… and your Vanquisher! 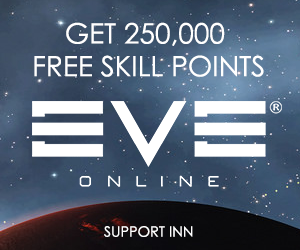 INN: Never not use it! Lx33: And, well, i bought it. So know…I used it. After a few seconds, I hear “ZAP THERES A CYNO ON THE VAN!”I alt-tabbed back over to see myself tackled. I told all the supers to warp off, including the subcaps. From there I knew it was dead, so I just chilled waiting for it to pop. Thank you to Lx33 for contacting us! And I would like to give him huge props for his positivity after such a loss: balls of steel. Sometimes Eve Online is a test to see who can resist boredom the longest. lol how f’ed up is that for a game? Hello! As you might have seen, this is an interview copy, that was held in a text channel. In general for interview, the text is kept “as is” as much as possible. This can lead to English mistakes, especially when the guy is not English speaking. In this case, I decided to correct the mistakes that could, in my opinion, alter the comprehension of the story. I however decided to keep the initial tone, phrasing and the easily understandable mistakes and/or abbreviations (like “gauds and prots”, which are not english either). Furthermore, I’d like to point out that Jesus has nothing to do with that… you might want to try “Bob” or Max Singularity, we are in Eve, for Bob’s sake!